Elliptic curve is the core mathematical function in elliptic curve cryptography (ECC). By utilizing its properties over finite field, namely the discrete logarithm problem, ECC works in a way different from traditional public key system where the basis is built upon large prime numbers and factorization. which is known as Weierstrass equation. The plot with a = -1 and b = 1 is shown in the below graph. and therefore the order or cardinality is 9. Nspire Graph application can be utilized to dynamically visualize and explore the properties of this curve. 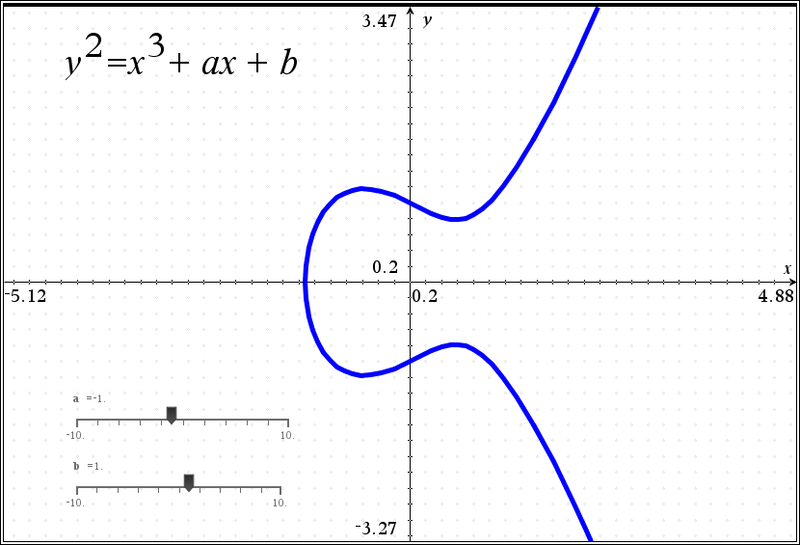 With the help of two sliders controlling variable a and b, the shape of the curve can be manipulated in real time. This entry was posted in calculator, TI nspire and tagged ECC, Elliptic curve, FIPS 186-3, Schoof's algorithm, Weierstrass equation on March 14, 2015 by gmgolem.